By Luis Bueno – RIVERSIDE, CA (Apr 24, 2019) US Soccer Players - Monterrey and Tigres UANL play their respective home games less than 10 miles from each other, practically rubbing elbows in the process. Such a local rivalry though is not only for the locals to enjoy. In fact, this one is for everybody. Monterrey and Tigres opened the two-leg final of the Concacaf Champions League on Tuesday, with . . . The roundup of USMNT players in Europe and Mexico starts in the 2.Bundesliga with another big game for Andrew Wooten. He scored both goals in Sandhausen's 2-2 draw at Joe Gyau's Duisburg. Wooten scored in the 28th minute and converted a penalty in the 62nd. Gyau subbed on in the 33rd, setting up Havard Nielsen's goal in the 71st. Duisburg's Kevin Wolze equalized from the penalty spot in the 88th . . . The roundup of USMNT players in Europe and Mexico starts in Liga MX with Michael Orozco scoring in Lobos BUAP's 1-1 draw at Morelia. Orozco scored in the 38th minute with Morelia equalizing in the 45th. Orozco subbed out in the 73rd minute. Ventura Alvarado's Necaxa won 2-1 at Santos Laguna. Facundo Castro scored for Necaxa in the 17th minute with Santos equalizing in the 55th. Rodrigo Contreras . . . The roundup of the USMNT players in Europe and Mexico starts in the Bundesliga with goals for Christian Pulisic and Andrew Wooten. Christian Pulisic subbed on in the 78th minute for Borussia Dortmund, triggering a late comeback to turn one point into three in the 3-1 home win over Stuttgart. Marco Reus put Dortmund up from the penalty spot int he 62nd with Stuttgart equalizing in the 71st. . . . The roundup of USMNT players in Europe and Mexico starts in the Bundesliga with a goal for John Brooks. Wolfsburg drew 1-1 with Werder Bremen. Brooks scored in the 54th minute with Max Kruse equalizing in the 74th. "We started the second-half in exactly the same way as the first because I told the lads to be patient and keep playing the way they were," Wolfsburg coach Bruno Labbadia said. . . .
By Jason Davis – WASHINGTON DC (Feb 22, 2019) US Soccer Players - Major League Soccer has a long way to go before it can say it has maxed out its potential in the United States and Canada. Despite rampant growth in the last decade and reaching 27 confirmed teams, no one believes that MLS is bumping up against the ceiling of what’s possible. That doesn’t guarantee a place among the world’s top . . . The roundup of USMNT players in Europe and Mexico starts in the Bundesliga with another strong performance from Tyler Adams. 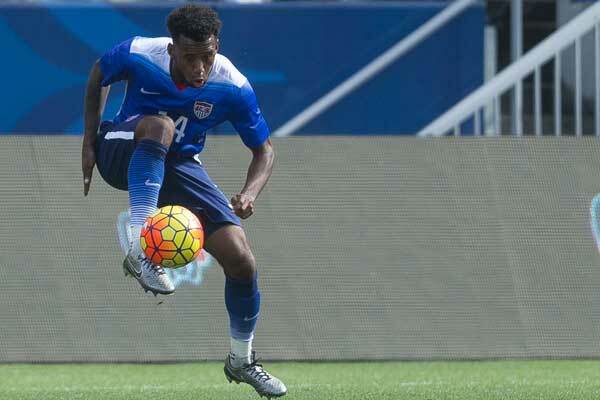 Julian Green converted a penalty in the 2.Bundesliga and Rubio Rubin scored twice in Mexico. Adams's RB Leipzig beat VfB Stuttgart 3-1 away. Yussuf Poulsen put Leipzig up in the 6th with Stuttgart equalizing from the penalty spot in the 16th. Marcel Sabitzer put Leipzig up . . .
Another super sub performance from headlines the roundup of USMNT players in Europe and Mexico. Weah subbed on in the 74th minute for Celtic's 2-0 away win at St Johnstone, scoring the second goal. James Forest put Celtic up in the 78th with Weah scoring in the 89th. Celtic finished a man down with a red card to Kristoffer Ajer three minutes into stoppage time. “Whatever time the coach gives me . . .